A city trip to the Baltic Sea island of Usedom at the picturesque Szczecin Lagoon will take visitors to famous seaside resorts along beaches with fine white sand. This island is one of the warmest regions in Germany with more than 2,000 hours of sunshine. The attraction of a mini-break in Usedom are the long beaches with fine white sand as well as the seaside resorts, such as Trassenheide, Zinnowitz and Karlshagen. Relaxing beach life and all types of water sports, such as surfing, water skiing, canoeing and sailing attract city travellers of all kinds to Usedom. The beautiful white villas of the famous resorts Heringsdorf, Bansin and Ahlbeck on the south-eastern coast exude the flair of life from a hundred years ago. Take a stroll along the 5 mile long promenade, the longest in Europe, which connects three villages. And the Heringsdorf Sea Bridge is considered the most opulent bridge in continental Europe spanning 555 yards. For families, the sea shell museum in Heringsdorf is a must. More than 3,000 sea shells in amazing sizes and shapes will make for an entertaining excursion. An adventurous trip while traveling to Usedom will take visitors into the untouched nature of the back country, surrounded by the Peenestrom Gat, deep green forests and bodies of water with astonishing flora and fauna. With some luck, you may even spot an impressive sea eagle which floats above the lagoon. A popular short trip destination on Usedom is the Mellenthin Moated Castle from the 16th century on the South banks of the backwater. In the North of the island in the Peenemünder Haken Nature Reserve, visitors can observe more than 100 breeding bird types, including cormorants, mute swans and greylag geese. Families will love the exciting submarine museum in Peenemünde. The pier is home to the 86 metre long submarine U-461 from 1960 which used to patrol the North Atlantic. Find out more about the confined life on board with very limited space. Some miles to the South of Peenemünde, the Baltic seaside resort of Zinnowitz invites visitors to the annual Vineta Festival. On the Baltic Sea stage, legend stories about the sunken city of Vineta will be performed here from late June until late August. In the neighbouring village of Trassenheide, the largest Butterfly Farm in Europe awaits. The flight hall is home to more than 2,000 colourful butterflies in all shades and sizes which flutter around between waterfalls and rocks. One of the most beautiful excursions while on a city trip to Usedom is a ride with the Usedom Bäderbahn rail to the former fishing village of Zempin. It is located to the south of Zinnowitz and invites visitors to marvel at thatched houses, fish smokehouses and rustic country inns where proper Pomeranian fish dishes are served. 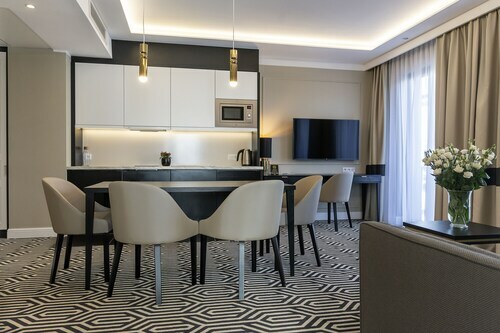 This family-friendly Swinoujscie hotel is located on the Strip, within 1 mi (2 km) of Park Zdrojowy and Swinoujscie Beach. Park Chopina and Museum of Marine Fisheries are also within 1 mile (2 km). 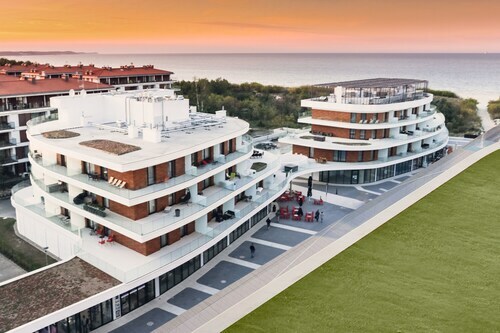 Situated near the beach, this hotel is within 1 mi (2 km) of Park Chopina and Swinoujscie Beach. Ahlbeck Beach and Christ the King Church are also within 1 mile (2 km). Ahlbeck Grenze Station is 14 minutes by foot. Offering direct access to the beach, this Swinoujscie aparthotel is within 1 mi (2 km) of Swinoujscie Beach and Christ the King Church. Ahlbeck Beach and Swinoujscie Lighthouse are also within 6 mi (10 km). Located in Heringsdorf, this beachfront hotel is on the boardwalk, 0.1 mi (0.1 km) from Bansin Beach and 1.6 mi (2.5 km) from Heringsdorf Pier. Hans Werner Richter House and Tropenhaus Bansin are also within 10 minutes. Bansin Seebad Station is 19 minutes by foot. Located in Heringsdorf, this beachfront resort is on the boardwalk and within a 10-minute walk of Ahlbeck Beach and Heringsdorf Pier. Swinoujscie Beach is 2.7 mi (4.4 km) away. Seebad Heringsdorf Station is 8 minutes by foot and Ahlbeck Ostseetherme Station is 11 minutes. Situated near the beach, this spa hotel is within 1 mile (2 km) of Park Chopina and Swinoujscie Beach. Christ the King Church and Museum of Marine Fisheries are also within 1 mile (2 km). Ahlbeck Grenze Station is 23 minutes by foot. 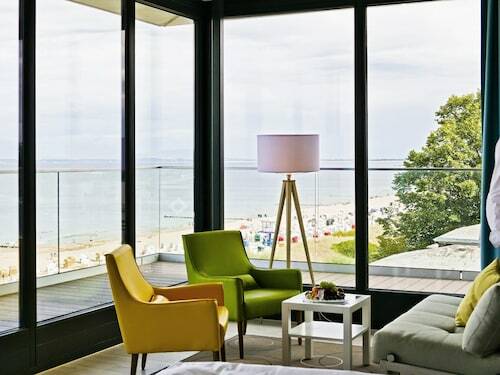 Situated by the sea, this spa hotel is within 1 mile (2 km) of Ahlbeck Beach and Heringsdorf Pier. Museum Villa Irmgard and Bansin Beach are also within 1 mile (2 km). Seebad Heringsdorf Station is 11 minutes by foot and Heringsdorf Neuhof Station is 18 minutes. 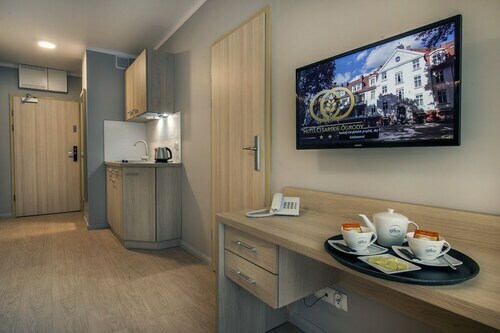 Situated in Swinoujscie, this apartment building is within 1 mi (2 km) of Park Zdrojowy and Swinoujscie Beach. Fort Aniola and Park Chopina are also within 1 mile (2 km).